An economic boom in the eighties helped renovate South Beach and shined up its Art Deco look, while the TV show, Miami Vice, popularized Miami and give it international fame. 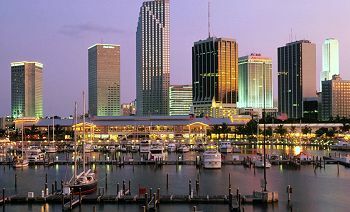 Miami is now the third most popular city for international tourists behind Los Angeles, and New York. 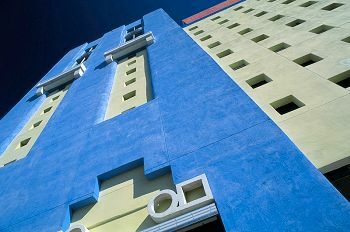 The Art Deco Historic District is on the National Register of Historic Places and is located in South Beach. This is where you will see the pastel colored buildings of pink blue and green. The late Gianna Versace's Casa Casuarina and the Coral House at 9th and Collins are highlights of the area. Miami Beach is one of the best city beaches with its clear, warm water and white sand. The most crowded sections are in South Beach from 5th Street to 21st Street. The area between 5th Street and South Point is a favorite of Latino families. The area near 12th Street is known as a gay beach. Little Havana: cigars, music and "zoom juice"
Venetian Pool - world's most beautiful swimming pool. Spring fed, caves, and waterfalls. Children's area, lap swimming, and lounging. Call for hours: 305 460-5356.